Opposites certainly do attract- especially when it comes to this fashion-forward pencil dress with contrast piping. The Polar Opposites Textured Pencil Dress With Fabric Piping is made of a textured fabric with a bit of stretch to it. It has wide shoulder straps with light padding in them for support. The classic fitted pencil cut of this dress is amped up with details like the cutout panels at the neckline and contrast fabric piping throughout. An exposed back zipper completes this bold, graphic look. The Polar Opposites Textured Pencil Dress With Fabric Piping looks great paired with black pumps or heels. Wear this to any networking event and work the room in style. Details: Unlined. Exposed back zipper. 95% Polyester, 5% spandex. Lining: 100% polyester. Hand wash cold. Do not bleach. Do not iron. Small measurements: Length from top of shoulder to hemline: 32". Bust: 30". 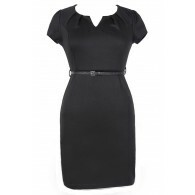 You have added Polar Opposites Textured Pencil Dress With Fabric Piping in Black into Wishlist. 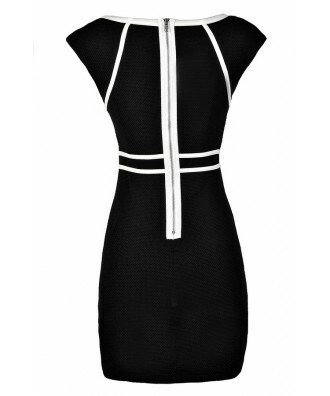 You have added Polar Opposites Textured Pencil Dress With Fabric Piping in Black for Stock Notification. You have set Polar Opposites Textured Pencil Dress With Fabric Piping in Black as a loved product. You have removed Polar Opposites Textured Pencil Dress With Fabric Piping in Black as a loved product.